Basically, if you contact us through Facebook or one of the postcards we sent you in the mail or you gave us a call or you found us online, you would contact us through one of those mediums, we would get some basic info from you like, name, phone number, address of the property you are selling, some details about the property such as number of bedrooms and bathrooms, the overall condition of the home, repairs it needs, recent updates. We will take that info you give and do some of our own additional research. We will figure out the After-Repair-Value of the home. We take that minus the repairs. We use that to make you your offer. An offer is made and accepted. When you go to sign that initial purchase agreement, no money is going to be exchanged. The initial purchase agreement is just a promise to purchase the house within a given period of time for a set amount of money. It stipulates certain terms and conditions. That the property must have a free and clear title. We determine who is paying which closing costs. The title company does title work. Sees if the house is free of any liens, judgments, assessments, back taxes, etc. To gain a free and clear title. To make sure the property can be sold with title insurance. There is a closing process where they prepare all the closing documents at the title company. They prepare all the documents, stating the title fees, the property taxes that are owed, etc. Any fees that are assessed. The seller will have their fees on any liens or judgments they owe. Their title fees. Or, I might agree as the buyer, to pay their title fees at the time of closing. The closing is scheduled at the title company. At closing, the buyer and seller will both sign the closing documents. The buyer and seller can schedule at separate times if they wish. Rest assured that the money will have to be deposited in escrow before the closing occurs. The property is not sold until it has gone through the closing process and the money has been deposited in the escrow to be held at the title company. …There is no direct exchange of cash or checks between the buyer and the seller. Instead, it is all handled by the title company. The title company ensures that the transaction is safe for both parties. They receive the money from the buyer and give it to you. They ensure the transaction, basically. 1. What is the process of getting it sold? It starts with the initial phone call. You tell me about the condition of the house and and show it to me. We agree on a price. You sign a purchase agreement. I come over inspect the house and see what kind of condition it is in. You go to the title company, sign your title over, and get your check. I gather information about the value of the property. I asses the value minus the repairs. I make the initial offer. I inspect the property physically, looking for any repairs or damages. I reassess the value of the property, then make you a final offer. We negotiate until we come to an agreement. Once we come to an agreement, I send a purchase agreement for you to sign. Once you sign the agreement, the title work will begin. Sometimes, depending on the situation, I may have contractors come through the property and evaluate further. I will have made that final offer, it will have been accepted already. (Negotiations at that point have typically ended. In certain situations we could renegotiate, but that is rare.) During that interim while the title work is being done, I like to have time to be able to bring some contractors over. What makes the difference between me and the other people that buy houses cash, is that I’m actually honest with you. A lot of people make a lot of promises, saying they’ll pay top dollar, or close in as little as 7 days. A difference between me and these people is that they don’t always deliver on their promises. My motto is to underpromise and overdeliver. Not to over-promise and under deliver. Because I like my customers to feel satisfied and happy while doing business with me. I like it to be a win-win situation for both parties. I am honest about how long its going to take to close. I’m going to be honest with you about what I think your property is worth, what I can actually offer you for the property, what it can actually sell for. With me you can either sell to an investor or through the retail market. Because, in addition to being an investor, I am a realtor also. So I can list your home, if that makes more sense for both of us. If it makes more sense for an investor to buy your home, I can do that. I will be honest with you and let you know what the best scenario for you is. I want to make sure it is a win-win situation for both parties. 2. How do I find out how much it is worth? Databases like Zillow show what other homes in your area are selling for. Keep in mind that many of these homes are fully functional and updated. Homes that are fully functional, fully updated, and clean can be sold for more. Homes sell for less if things are broken, missing, or old. In order to determine how much I think you can get selling your house, I look at the price other homes are selling for. Then, I estimate how much it would cost for professional contractors to do the rehab on your house. I subtract that from the comparison price. I use that information to determine the price that your home will sell for as-is. As a real estate agent I also have access to the MLS where which all of the properties sell on the retail market. The initial phone call when you first speak will only take about 5-10 mins on the phone. The visit where you show me your house and I take pictures takes about 10-15 minutes sometimes longer. To make sure there is a free and clear title on the house, that is free and clear of any judgements, liens, assessments or anything like that typically takes anywhere from 2-3 weeks depending on how busy the title company is. From start to finish the entire process typically takes 2-3 weeks from the time of our first phone call or email to closing to pick up your check at the title company. 4. I don’t have time to clean it out or replace carpet and make repairs. The nice thing about selling your house fast for cash, is that you don’t need to make repairs. Your house is bought as is. Don’t worry, I have most likely seen it all. When you initially tell me about your house, I will ask you questions about the condition of your house. This is to see how much money will be needed to repair and update your home after you sell it. For example, are the roof, furnace, and water heater still intact? If so, when were they last replaced? Are plumbing and electricity working? Is the foundation solid? Etc. Another important thing is how your home compares to other homes nearby. For example, how many bedrooms and bathrooms are in your home? Do any of the rooms need repairs or updates, for example, does your kitchen need new cabinets? 5. How long until I can sell the house? Typically two to three weeks, depending on the the title work on your home. If it already has a free and clear title, the home will be able to close quicker. In order to sell your house, you must have a free and clear title to the house. Don’t panic! Some of my customers don’t have free and clear titles to their houses and most of the time you will know if you don’t. However, many houses have titles with judgments, liens, etc., attached. This could be due to back taxes on the house that were left unpaid, or judgments on the owner for unpaid child support or other unpaid public business deals. Perhaps the city has declared your house a dangerous building or boarded it up. There is often a fee for that which is tied to your title. You can designate some of the money you get from selling your house to pay these fees and fines at closing, freeing the property title so the deal can close. A lot of people like this process, because it enables them to sell their home without having to come up with the money ahead of time to pay these fees. 6. Is the money taxable? As always in life, you are responsible for determining your income and reporting it to the IRS and any other applicable entities. 7. What do I need to do to get the ball rolling? Just contact me in whatever manner is most convenient for you. You can call me. Or, you can fill out the questionnaire on my website. Or you can message me on Facebook. Just reach out to me and we’ll get started. All you need is to contact me, and to have a house or property you want to sell. Don’t be shy! I am available to answer questions and help you decide whether you would like to use my service to sell your home. Sell your home to a company who cares about their clients and will actually pay them the most money they can for their home. 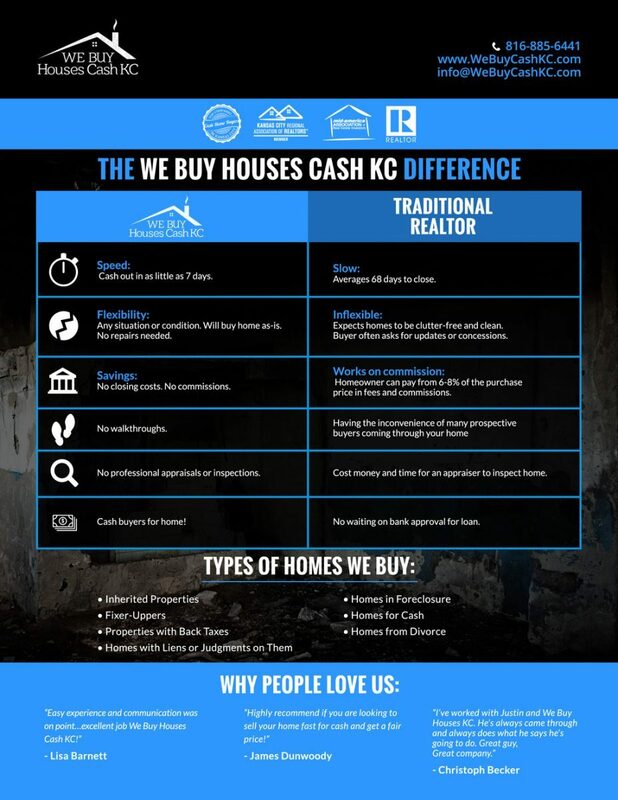 We Buy Cash Kc has also committed to giving back by for each home that we buy sponsoring a child from a third world country for an entire year after when we purchase your home. Help us change the lives of families and children all across the world buying selling your homes to We Buy Cash Kc. We are a local company and are committed to hiring people who live here in the Kansas City metro, a lot of companies outsource their people from other countries. We are also a company who is committed to giving to local charities as well. We are honest and we actually pay you a fair price for your home and we always do what we say we are going to do. We deliver results when a lot of other companies just talk about it.